Having a baby means making lots of important decisions – whether to breastfeed her, sleep-train her, sign her up for newborn piano lessons, and the list goes on. Perhaps the most fraught for us was choosing on a design concept for our nursery (only kinda kidding). 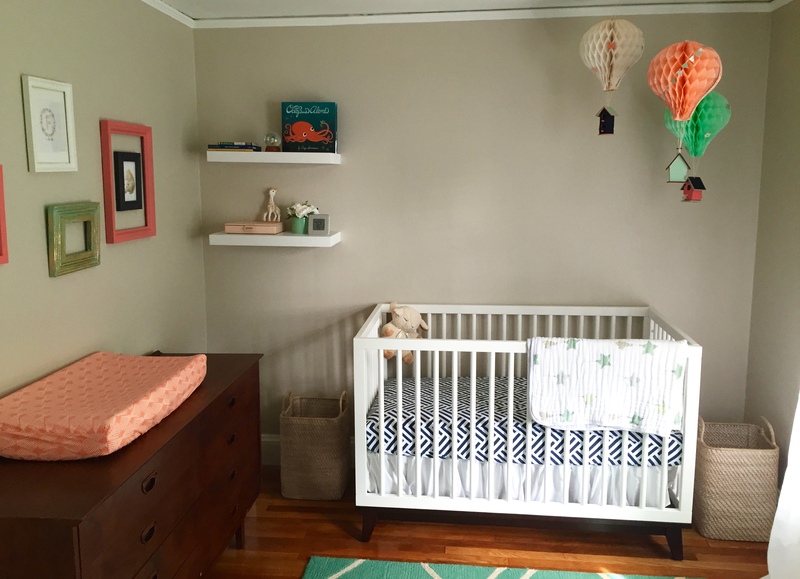 After multiple trips to Home Depot’s paint department and countless pins to our private “baby” Pinterest board, we settled on beige paint with coral, mint, and navy hot air ballon accents. While we were not so patiently waiting for Fiona’s arrival, it was useful to channel our energy into preparing for her. If combing Etsy for coral, green and navy accents was an Olympic event, I’d have a gold medal. 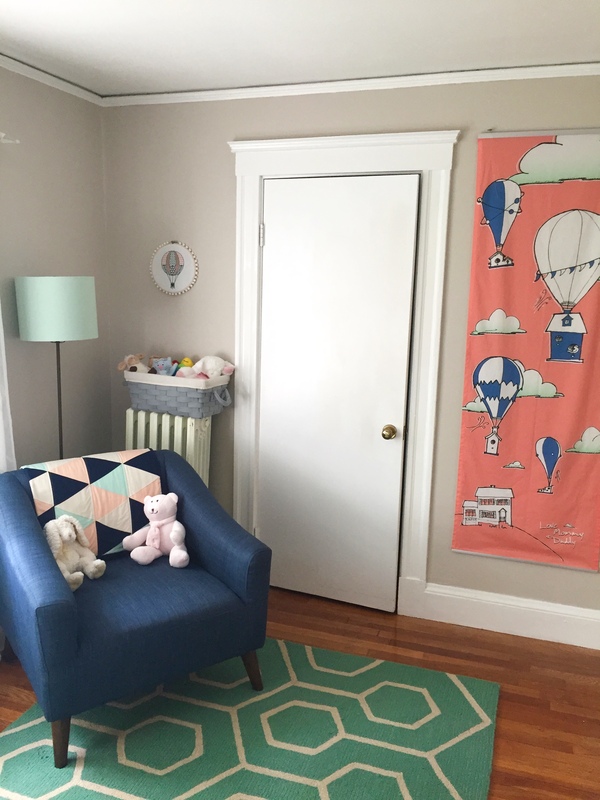 We love her custom quit from Little Bear Quilt shop, her custom art work from Invited by Audrina, and her coral changing table pad from Whimsical and Witty. It was also so much fun to make our own contributions to Fiona’s space. I dusted off my cross-stitch skills and found a great pattern online. I like the look of keeping the project in the hoop and jazzed it up a bit by hot gluing pom poms around the edge. Jason found a company (spoon flower) that prints designs onto fabric and made a beautiful banner in Fiona’s color scheme. Note that the house in the bottom of the banner is our h ouse!! We are also particularly proud of her hot air balloon mobile. 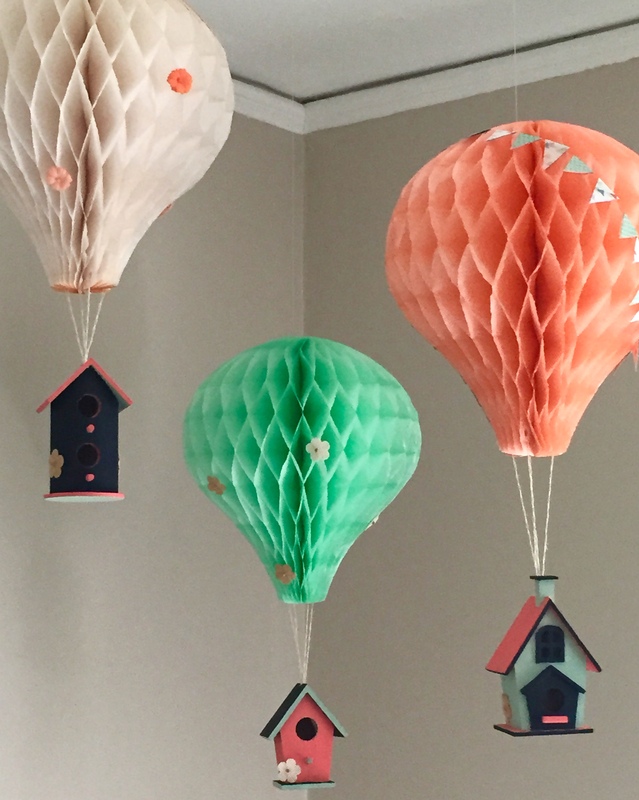 We attached round party poufs (purchased on Amazon) cut in the shape of balloons to little wooden houses (purchased at Michaels). Jason painted the houses in our theme colors and I hot glued the flowers and flags (cut from origami paper) to jazz the balloons up a bit. We used fishing line to attach the hot air balloon to the ceiling so it looks like they’re floating. Finally, to encourage our little reader, Jason constructed a book trough to store her reading material! This was constructed with a few pieces for wood from home depot and loaded up with wonderful books that were given to Fiona at our baby shower. 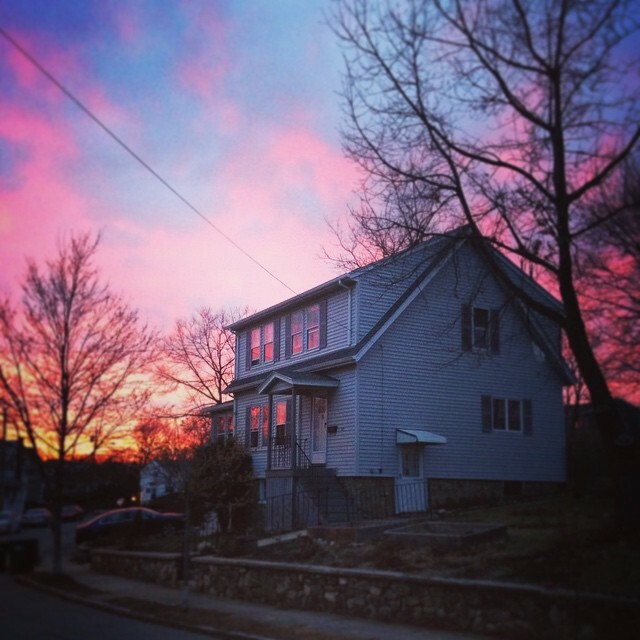 After all this hard work, we were so excited to be featured on Apartment Therapy! We have used that blog for inspiration in all of our decorating, so it was amazing to be featured on the site ourselves. We saw Fiona’s room up on the blog the day we left for the hospital – and two loooong days later she was born. ***update July 22, 2018: This room is the first of many hand-me-downs for little sister, Skylar, who recently moved in. Absolutely love Fiona’s room. 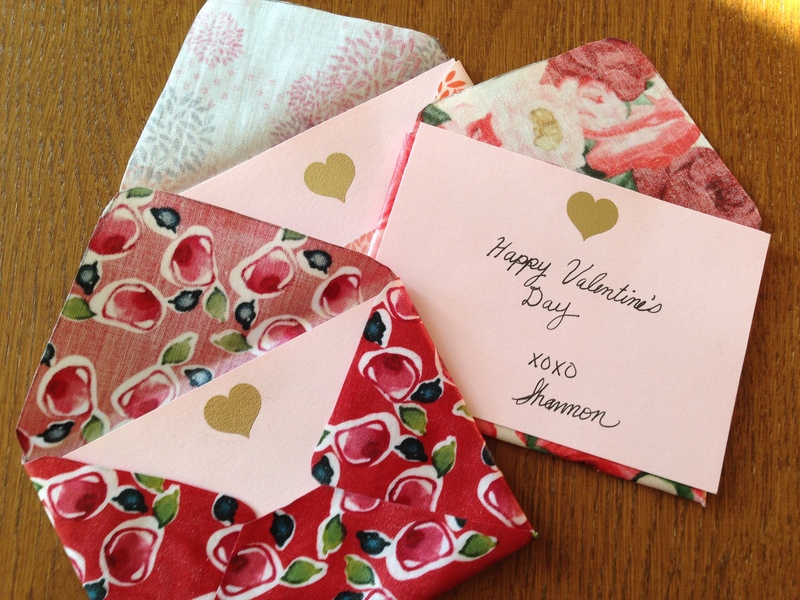 You two just fiiled her room with so much love with all your personal touches! You guys are an amazing creative team!